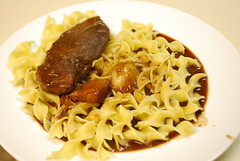 A few times when we've talked about taking on a more involved cooking project, Austin has suggested the classic coq au vin (a dish that transports me to back to my college French Civ courses, Henri IV, poulet au pot...) but we only got around to making it this past weekend. The recipe we used required making the base a day ahead of actually finishing the dish so on Saturday evening, we began the process. 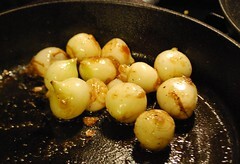 The pearl onions smelled so good sauteing in, um, let's call it foie de lardon. 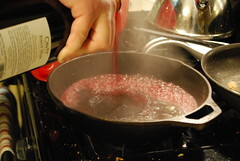 We threw in and browned a few chicken breasts then deglazed with Pinot Noir. 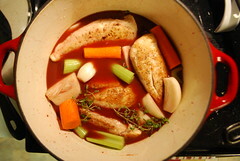 We tossed in some veg and poured in a lot more wine and then our El Creuset* pot was tucked into the fridge. 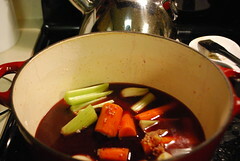 The next day, our pot-o-stew simmered merrily on the stove and our house smelled a-freaking-mazing. As recommended, and 'cuz we had some on hand, we served it over egg noodles. I had a bite of the chicken breast and decided I'd just stick with the pasta and sauce. Our big project tasted... drum roll... well, just sorta "meh." We were underwhelmed. We were not, however, put out in any way. The process of making the dish was enjoyable and fun and not everything turns out great. We were not at all deflated, just pragmatic, but then we tried the side. I got the recipe from Pioneer Woman, a blog that some friends of mine swear by but that I hadn't looked in to too much. Well. Was I wrong. 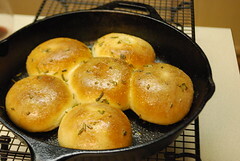 These were dinner rolls! Made from frozen dough! But if you follow her instructions, wow, they were fantastic. We keep talking about them days later. Yeah, that good. *We call it "El Creuset" since it is a Le Creuset knock-off but hey, it was highly recommended in Cooks Illustrated, works great, and was inexpensive.